We have established ourselves as one of the prominent Standard Flame Arrestor Valves Exporters in India. Our Flame Arrestor Valves are extremely capable of putting out fires with their sub-sonic speed. Our Flanged Flame Arrestor Valves are passed through stringent quality checks, under the guidance of experts, to assure strength and performance. We have established a track record for timely delivery and exceptional quality of products. The best of raw materials are used in the production of these valves to ensure a durable life and flawless functioning. 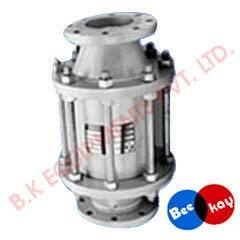 The valves are provided at reasonable prices in the market. We adhere to international standards of quality when manufacturing our products. Materials SS 304/316 stainless steel.